Grosgrain: Twinkle Little Star Refashion Frock GROSGRAIN GIVEAWAY!!!! CLOSED. Twinkle Little Star Refashion Frock GROSGRAIN GIVEAWAY!!!! CLOSED. By request, I searched for a refashion frock at the Salvation Army last week. The survey I conducted a month ago indicated that many of you would like to see more refashion frocks. I have to admit, I like these because often they are less work. Around New Year's I had been seeing many party dresses with tulle on the outside of the skirt rather than underneath and wanted to recreate something like that. When I looked through the Salvation Army racks I searched for a dress with a little glamour in the fabric, something the said "party". I came across the dress (at bottom). 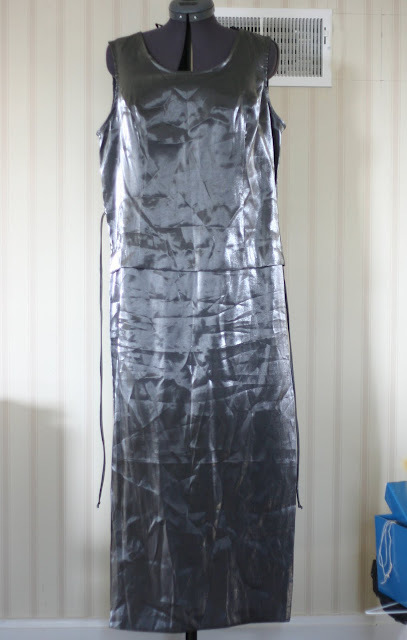 The material was a shimmery silver but the cut of the dress was hideous. Perfect for refashioning. It was a matronly faux two piece with no form except for the two spaghetti straps on the sides which pulled the waist to fit the person wearing it. I bought it for $1.50 and took it home to think it over. I definitely wanted to try and go for the topside tulle look. So I went to the fabric store and bought 3 yards of gray tulle for only 30 cents a yard. What I loved about the tulle I bought was that I didn't even need to cut it. The length and width were already the perfect size I needed. All I need to do was gather it. I laid the dress on floor and stared at it for some time. The skirt was so straight that it was very difficult to get an a-line out of it despite the fact that it was quite large. I cut the top piece away from the bottom and then cut the bottom into two side-by-side triangles that made a rectangle using as much of the skirt material as possible. I then pinned the pieces to my dress form but still came up a little short of an a-line on either side. So I cut out two more smaller triangles from my leftover skirt and filled in the gaps to make a perfect a-line. I then sewed the gathered tulle to the skirt and the combination of those two pieces to the waistband. I had to take the top in on the sides. After I did that I sewed the top of the waistband to the bodice. Finally I cut a ballerina neckline into the top and hemmed the skirt and sewed in a zipper. VOILA! A new dress!! Chan looks ready for a New Year's Eve Soiree. I really liked how the tulle filled out the look of the skirt. I wanted a full a-line. The skirt underneath was not quite as full as I would have liked but with the overlaying tulle the look was exactly what I was going for. All together I spent $2.50 on this dress. Not bad. See a similar one on Modcloth here. Since I had little material to work with I'd say this dress would fit a size 2-5. Quite skinny. This is precious! It would make a great gift for my sister! OHMYGOODNESS. i adore this dress! i hope i win, thanks! This is so great! Would love to win! That is totally amazing. I love the dress! This is gorgeous. Now all I need is to drop about 4 sizes :). I have a friend that would look amazing in this. this is too, too cute.... you rock! you not only have AN EYE FOR WHAT COULD BE but you have THE KNOW HOW TO MAKE IT HAPPEN...what a talent!!! I think I say this about all of your stunning creations but this one is my favorite! That is just gorgeous! Fantastic job!! Makes me want to go out bargain hunting at the Salvation Army as well. Oh I cannot WAIT until we get our taxes done. I see a dressform in my future! Oh, I love this dress!! :) You are so talented to be able to sew like that! Wow! So cute! I love the color! Love this dress! So awesome that you repurposed! So, so cute! I have been loving the tulle skirt look lately -- I'm actually looking at wedding dresses with a tulle skirt! I just can't get enough of the party princess look! WOW! I am so impressed! I think this one is one of my favorites! Great work! Beautiful! Perfect color for icy January! You are just a genius - that dress is Amazing! It would fit my sister for sure! beautiful i love the grey- so different! Love the color of the dress. Ballerina style has always been my favorite. Your designs/refashions are very inspiring! I love what you've done here, it's like a magic trick. Do it again! Do it again! Ew, that dress NEEDED a refashion. Your version is perfect. Unfortunately I'm about a size to big to squeeze in, but I'm excited to go try something like this myself. Thank you for doing another refashion! Always, always love those. Oh my daughter would look simply fab in this dress! This dress is absolutely beautiful! I would love to wear it to my next dance-- no one else would have it! I love, LOVE this dress!! Oh my gosh! That dress is absolutely beautiful! Great job! I would love it. I would love to win this dress! Sign me up! I pray I win!!!!! Beautiful dress. After having a baby in August, I haven't really gotten to put anything pretty on in a year! I'd love to wear it. I love this dress! I could definitely wear it at many different occasions! So pretty! Amazing, such a beautiful transformation. Funnily enough, just posted about my daughters wearing my wedding dress, school holiday fun!! This is SO cute! How do you do this! You are amazing :) Linked up and crossing my fingers to win! This would be such a pretty New Years dress!!! I'd like to see it with gray pearls. omg how amazing that you made such a beautiful dress out of something so ugly!!! You have major talent!!! sew cute! wish i was that creative!!! love it love it! 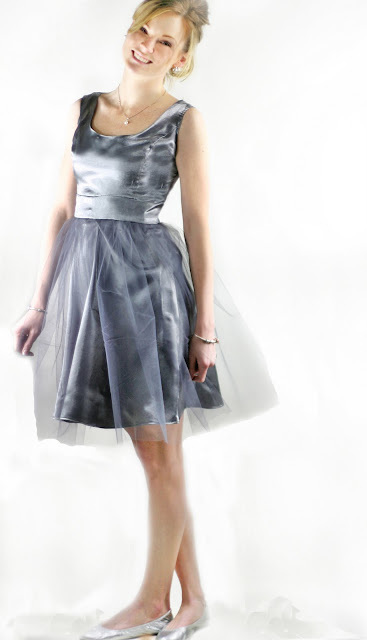 What an amazing talent you have seeing the diamond in this frumpy shimmery dress! I am impressed. I don't want to enter the competition but wanted to say I really enjoy your refashions. Ohhhh...pick me! pick me! pick me...this is so adorable! This is absolutely lovely! It is amazing how beautiful it was when it used to be so ugly!! Oh my goodness, this dress is beautiful! I would love to wear to an upcoming wedding! Wow, what an amazing refashion! What an amazing talent to be able to remake a homely dress into something so current. Love it! Wow!! Good work! That is super amazing! Beautiful. Good work & very creative!! Great job! you have a great imagination for design! I admire you! Oh my goodness. You are incredibly creative, and what a wonderful masterpiece you have made here! oh wow! i really love this! and it would be the perfect dress for a post-baby wedding appearance! What an amazing transformation!!! I love the end result!! I love this new dress, so much better than the old ugly one! What a fun dress! I love it and want to win! You are wonderfully talented - you have done a fab job. I ADORE that dress! You did an incredible job! I would be thrilled to win it! Oh man, the original dress is like a big rubbish sack, or something. I'm always finding stuff like this in charity shops and not having a clue of how to refashion it, so your transformative skills are inspiring! WOW that dress is SOOO pretty!!! I REALLY Hope I can win it!! I linked. I love. Pick me. Lovely dress, and what a beautiful color! I am very impressed and would be so proud to wear it! Gorgeous frock!! So shining with net. I like this design very much. Wow! Makes me want to get out my sewing machine again! I am helping to host a fundraiser Oscar party and I need this dress! I could fit into a 5 but not a 2. Fingers crossed I'll win and it will fit. My sister is just the right size for this - your refashions are quite inspiring! You are just so talented! I wish I could figure out how to do something like this.